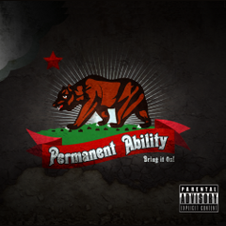 PERMANENT ABILITY from the USA, is a band launched in 2008 by Brian Lanese who is a three time Emmy Award Winner and recent Grammy Nominee. Also Lanese sings, writes, and produces all the music and lyrics for the band. His bloodline notes a relation to Mark Twain and his writing mirrors that of his famous ancestor. 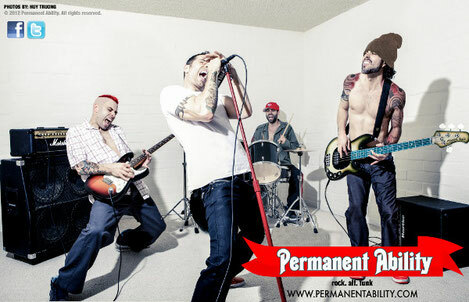 Permanent Ability's sound and style are incomparable to the dime a dozen and cliched acts found in Los Angeles. Backed by legendary producer Jim Wirt and first round ballot Grammy Nominations, Permanent Ability's name has become synonymous with the revival and new direction of the funk-rock genre. Actually Brian's collaboration with Jim helped earn Permanent Ability five first round ballot Grammy Nominations in the categories: "Best Alternative Album", "Best Performance by Group", "Best Package Design", "Producer of the Year", and "Best Rock Song." The band released 2 EPs so far, their debut EP "From the Womb to Hollywood" (2008) and another EP "Bring It On" (2010). They will release their first full-length album "Love You to Death" featuring Mario Pagliarulo (Serj Tankian) in this year. Their collection of headlining gigs include venues such as the House of Blues Los Angeles, The Viper Room, The Roxy, and the Whisky A Go Go. With east-coast roots, Permanent Ability has established their brand of funk-rock music within the Los Angeles scene.